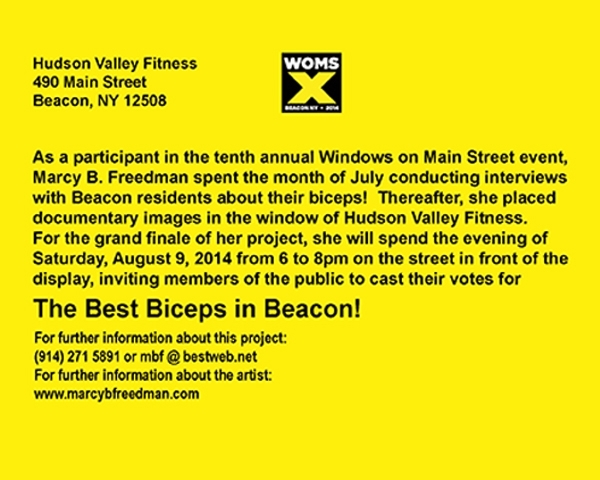 For this year’s annual Windows on Main Street event, I merged video and interactive performance art into a project called “The Best Biceps in Beacon!” Since my project was focused upon fitness, it was perfectly aligned with the business — Hudson Valley Fitness — that so kindly allowed me to install my work. My window installation was the product of several steps. In July, I spent two days on the streets of Beacon, inviting members of the public to chat with me about their health and fitness. At the conclusion of each conversation, I asked the participant to bare one arm to reveal a bicep muscle. With my video camera, I documented these diverse biceps. 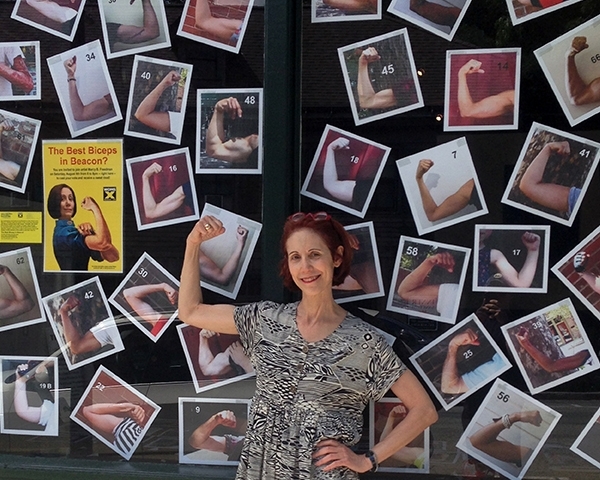 Thereafter, I used still images from the video footage to create a photographic collage of biceps for the large windows at Hudson Valley Fitness. However, the creation of this display did not mark the end point of my project. 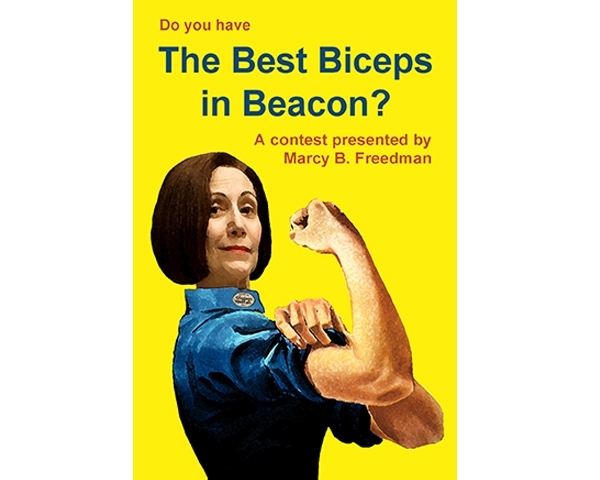 During the opening reception for Windows on Main Street, I stood in front of the window and encouraged people to vote for “the best biceps” on view and to explain the reasons for their selection. 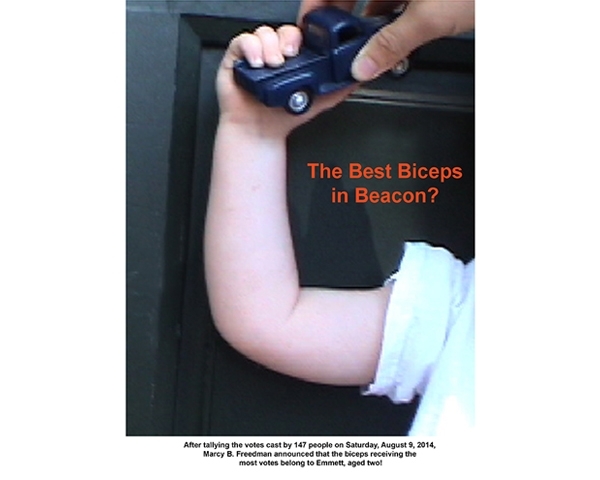 There were 147 votes cast, and to my great surprise, the winning biceps were those of a two-year old boy named Emmett! Indeed, was happy to find that people voted for all sorts of arms. One of the oldest participants received many votes, as did a weak and sickly fellow with skinny and mottled arms. Predictably, there were votes for the big, tattoed muscles of body builders and for the svelte and firm arms of young women. For me, the one-on-one, face-to-face conversations with people from all walks of life were more important than the final photographic display! After all, my goal as a performance artist is to provide an antidote to our growing addiction to “virtual” forms of communication, such as email, texting, social networking. I believe that the conversational aspects of my project demonstrated the beauty and power of real, live communication in real time and real space! Addendum: I later learned that I had won an award for this project! 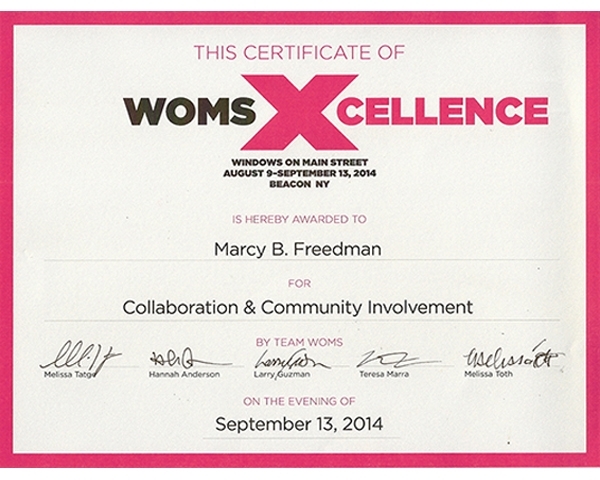 “The Best Biceps in Beacon” received a certificate of XCELLENCE for Collaboration and Community Involvement from the organizers of Windows on Main Street. I was honored and thrilled!